Why did Stalin exterminate the Ukrainians? The Holodomor is a phenomenon that is hard to fathom. To do so one must find a rational explanation for the actions of those who organized it, and discover the logic and political interests that drove them. In the case of other large- scale tragedies, the perpetrators’ logic was absolutely transparent. The Turkish governments and the Nazis exterminated the Greeks, Armenians, and Jews precisely because they were Greeks, Armenians, and Jews. Did the communists really always exterminate the Ukrainians because of their nationality? Even if we say that rank-and-file communists were puppets in the hands of the leaders of the All-Union Communist Party (Bolshevik), who in turn were puppets in the hands of the General Secretary (which is true to a certain extent), the question of why Stalin exterminated the Ukrainians in 1933 remains unanswered. The absence of a convincing answer to this question does not mean that it is impossible to find. It is no accident that groups of eminent experts — the US Congressional Commission on the Ukraine Famine and the International Commission of Inquiry into the 1932-33 Famine in Ukraine — concluded in 1988 and 1989, respectively, that the Holodomor was an act of genocide. Both commissions left it up to experts to corroborate this conclusion. We must examine how experts used the decade and a half of the time they have had at their disposal. Not so long ago the Institute of Ukrainian History at the National Academy of Sciences produced a fundamental study of terrorist acts and terrorism on Ukrainian territory in the 19th and 20th centuries. It represents our attempt to explore the essence of state terror and individual terrorism. There is quite enough concrete material about terror and terrorism in Ukrainian history of the past two decades for a thorough exploration of this issue. One characteristic of terror and terrorism has escaped the attention of our scholars, including me. Judging by the word terror (from the French terreur, meaning terror, panic), terrorism is aimed at demonstrativeness, showiness. Someone is destroyed in order to show others what will happen to them if they do not change their conduct with respect to a certain question. A typical example of such terror was dekulakization, i.e., repressions directed at a certain proportion of peasants (from 2 to 5 percent of the village population) in order through terror to force other peasants to join collective farms. The level of wealth was the only criterion for selecting kurkuls. More than others, wealthy peasants wanted to preserve their private property, which provided them with the means of subsistence. However, the status of a poor peasant did not provide immunity to those who were unwilling to join. Such peasants were repressed as subkurkuls. True, proposals are being made to amend the UN Convention of Dec. 9, 1948, by adding the notion “social genocide.” Social groups also suffer from brutal persecution aimed at their extermination. However, “sociocide” and “classicide” have yet to become legal notions, which is why they are not relevant to our discussion. At first glance, terror by famine has no characteristic features. It is indiscriminate killing over a wide area. Its victims are not individuals whom the perpetrator of repressions considers dangerous or “whipping boys” chosen at random, but all people in a certain territory, including children and pregnant women. Because the technology of terror by famine did not require it to show characteristic features and because it lacked “ideological security,” to use the parlance of Soviet newspapers (after all, how can you explain the need to kill children and pregnant women?) this repression was committed in silence. Terror by famine is silent terror. Then what was its underlying sense? How can we find the hidden characteristic features that are indispensable to any form of terror in the Soviet government’s actions, which were aimed at depriving peasants not only of grain but of all kinds of food. An answer to this question will help us understand why Stalin exterminated Ukrainian peasants not always and not everywhere (as Greeks, Armenians, Jews, and Gypsies had been exterminated), but (a) in 1932-1933 and (b) in two administrative-political creations where the Ukrainian population constituted a majority: in the Ukrainian SSR and the Kuban district of the Northern Caucasus. I know the answer, but I cannot provide it right away. An immediate answer would be nothing more than an expression of my personal viewpoint. Too many personal viewpoints based on emotions have been voiced in connection with the Holodomor. I would like my readers to arrive at the answer to this question independently by providing them with the requisite mass of undeniable facts. This exploration should begin with an analysis of the background to this question. We need to ascertain how the Ukrainian Holodomor was understood in time and space. It is no wonder perhaps that the peasants, who were being exterminated by means of famine, immediately understood the true situation. Holodomor survivors told James Mace’s associates that the government was purposefully exterminating them. They could not prove it with documents, but sensed with all their being the Soviet government’s evil intentions. It is no surprise that based on this testimony, the US Congressional Commission concluded that the famine of 1932-1933 in Ukraine was an act of genocide. That people were dying of hunger was not known outside of areas where these people were dying. The mass media kept silent. It was even forbidden to use the word “famine” in top secret official documents of Soviet Communist Party agencies. Further down the text you will find an example that this rule was also observed at the pinnacle of the pyramid of power, i.e., in the Politburo of the Central Committee of the All-Union Communist Party (VKP[b]). Whenever it was necessary for the government to intervene — if only to bury the dead, appropriate instructions to subordinates were handed down as part of the “ osobaya papka” [special file] (much like the term Chekist, the words osobist [special agent], osobyi otdel [special section], or osobaya papka [special file] do not have equivalents in the Ukrainian language). Perhaps this was done not only to conceal information. Famine was an open secret in all the affected regions. The people who were victimized by the famine knew about it. “Special files” were necessary to rule out official and unofficial discussions of the famine in the Communist Party milieu and that of Soviet functionaries. Among normal people such discussions would lead to the question: How can we help? Meanwhile, no assistance was envisioned. Therefore, the veil of silence around the famine was one of the mechanisms of genocide. I can comment on this abstract from Khrushchev’s memoirs only in connection with the date of the Holodomor. When Khrushchev tape-recorded his thoughts on his past life after his retirement, he mentioned the wrong date, which is very telling. In the first half of 1932 there was an outbreak of famine in Ukraine with tens of thousands of deaths and even cases of cannibalism. It resulted from the grain procurement campaign after the 1931 harvest. However, the Holodomor did not happen then. The Holodomor resulted from the seizure of all grain after the 1932 harvest, which was followed by expropriations of all remaining food supplies. Deaths from the Holodomor began in the late fall of 1932, and the death toll peaked in June 1933. I must add that you will not find the above quotation in the famous four-volume compilation of Khrushchev’s memoirs. It comes from a different version of transcripts, published in the March 1990 issue of the magazine Voprosy Istorii [Questions of History]. As we know today, Western special services and diplomatic representatives possessed more accurate information about what was happening in the Soviet Union. In particular, the British Foreign Office and the British government had diverse and extensive information from multiple sources, as evidenced by the compilation of documents The Foreign Office and the Famine: British Documents on Ukraine and the Great Famine of 1932-33, published in 1988 in Kingston, USA [sic], and edited by Bohdan Kordan, Lubomyr Luciuk, and Marco Carynnyk. Benito Mussolini was well informed about the Holodomor. Italy’s General Consul Sergio Gradenigo sent him detailed and accurate reports from Kharkiv. The reports filled an entire book compiled by Andrea Graziosi and published in Turin in 1991. He now plans to have it translated into Ukrainian. The then newly-elected US president, Franklin Delano Roosevelt, was also well aware of the situation in the Soviet Union. However, like all the other leaders of the great powers, in his relations with the Kremlin Roosevelt was guided exclusively by national interests. In 1933 Stalin began to seek a rapprochement with the Western democracies, because he did not expect to coexist peacefully with Adolph Hitler, who had come to power in Germany. The Western democracies welcomed this foreign policy change. In the fall of 1933 the US recognized the Soviet Union. Thus, the tragedy of the Holodomor was played out in plain view of leaders and chiefs, who chose to remain silent. The current heads of the leading nations should remember this when the question of recognizing the Ukrainian Holodomor of 1933 as an act of genocide is raised again at the UN assembly. Unlike the political leaders who remained silent, Western journalists more often than not carried out their professional duty if they succeeded in visiting regions that were affected by famine. The Maxim Gorky State Scholarly Library of Odesa compiled and published a bibliography of the Ukrainian Holodomor partially with its own money and, most importantly, with donations from the Ukrainian diaspora, collected by Wolodymyr Motyka (Australia) and M. Kots (US). Its compilers, L. Buryan and I. Rikun, located over 6,000 publications that were published before 1999 inclusively. In the foreign press they found 33 publications dated 1932 and 180 dated 1933. Judging by this bibliographic index, the Holodomor was especially broadly covered by the Ukrainian-language newspaper Svoboda, published in Jersey City (state of New Jersey). Its article of Feb. 15, 1932, has a characteristic headline: “Moscow wants to starve Ukrainian peasants to death.” This headline proves that the assessment of the famine that resulted from the grain procurement campaign after the 1931 harvest was an emotional one. In reality, this famine cannot be classified as genocide as defined in the Convention. The state seized all the grain, which caused deaths among the peasants. According to my estimates, 144,000 people died of hunger during 1932. However, in the first half of 1932 there were no signs of terror by famine. On the contrary, when the famine was officially established, the starving population obtained relief in the form of 13.5 million poods of grain [1 pood=36.1 pounds, or 16.39 kilograms — Ed.]. With its May 21 decree the Council of People’s Commissars of the Ukrainian SSR identified the areas most affected by famine. They received additional relief in the form of food-grade grain, fish, and canned foods. Svoboda published reports that were circulated within a rather small circle of Ukrainian diaspora representatives. The first analytical stories about the Soviet famine were by the journalist Malcolm Muggeridge. He managed to make a journey through the Northern Caucasus and Ukraine before the Politburo’s Feb. 23, 1933, banning decree “On foreign correspondents’ trips within the USSR.” In March of that year he published his impressions in the English newspaper The Manchester Guardian. His three fact-filled articles left no doubt as to the famine that was spreading in the main grain-growing belt of the USSR. In the wake of Muggeridge’s material, this newspaper carried an article entitled “Famine in Russia,” based on the personal impressions of Gareth Jones, the former secretary of Prime Minister Lloyd George of Great Britain. The author said that Russia was in the grip of a famine on the scale of the one it had experienced in 1921. Walter Duranty, the New York Times correspondent, who was a British citizen, tried to refute the sensational reports in The Manchester Guardian. The essence of his article published in the Mar. 31, 1933, issue is reflected in its heading: “Russians Hungry Not Starving.” Notably, Duranty is the only Western journalist who ever managed to interview Stalin. He always tried to write his articles in such a way as not to displease the Kremlin. Information about famine on a horrible scale in Russia continued to leak through the Iron Curtain. On Aug. 21, 1933, the New York Herald Tribune published material by Ralph Barnes with a first estimate of the number of those who had perished — one million. Duranty also confirmed that there was famine. Although he did not say so directly, it follows from his short article in the Aug. 24, 1933, issue of the New York Times that at least two million people had perished. A day later this newspaper carried a report by Frederick Birchall, quoting a figure of four million dead. The Soviet government spared neither time nor effort to hide the consequences of the famine from foreigners. On Dec. 6, 1932, the All-Ukrainian Central Executive Committee and the ONK of the Uk- rainian SSR issued a decree (and published it in order to scare people) to “blacklist” five villages that could not fulfill the government’s grain procurement quota for a long period of time. An invention of Lazar Kaganovich, the “blacklist,” meant that villagers were banned from leaving the village, deliveries of all foodstuffs to the village were suspended, and searches at the farms of “deadbeats” continued until all food was expropriated. Famine claimed all the villagers in Havrylivka in Mezhova raion, Dnipropetrovsk oblast. 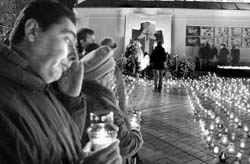 This tragedy became known abroad, and American journalists requested permission to visit Dnipropetrovsk oblast. Permission was granted with surprising ease. In his book Russia Today: What We Can Learn from It, published in New York in 1934, Eddy Sherwood writes: “A group of foreign visitors heard rumors that in the village of Havrylivka all the people except for one had died of hunger. They decided to investigate and visited the local registrar’s office, the priest, the local council, the judge, and the teacher... It turned out that three out of 1,100 residents had died of typhus. Measures were taken to stop the epidemic. There were no deaths from hunger.” [Translations of cited passages here and elsewhere are not the published versions — Ed.]. There is no doubt that the American journalist honestly reported what he saw. But there is also no doubt that all the original residents of Havrylivka starved to death. The visit to the USSR by the prominent French politician Edouard Herriot, the president of the French National Assembly and former prime minister, caused the State Political Directorate (GPU) even more problems. According to the distinguished guest’s request, his itinerary included a trip to Ukraine and the Northern Caucasus, which, he was told, were hardest hit by the famine. A day before Herriot was scheduled to arrive in the Soviet Union, Stalin, who was staying at a resort in the Northern Caucasus, sent a memo to Viacheslav Molotov, Lazar Kaganovich, and Genrikh Yagoda, the de facto head of the Joint State Political Department (OGPU): “According to information in possession of Yevdokimov (official OGPU representative in the Northern Caucasus — Author), the White Guardists are preparing a terrorist attack against Herriot in Odesa or other locations in the USSR. In my view, Yevdokimov’s proposals are justified. Balytsky (official OGPU representative and head of the GPU of the Ukrainian SSR — Author) must be immediately instructed to personally visit all locations visited by Herriot and take all preventive measures against all possible excesses.” As we can see, Stalin used Aesopian language even when he was issuing instructions to his associates to prevent the distinguished guest from seeing signs of famine. This is striking. In the USSR during the latter half of the 1930s the topic of the famine was no longer relevant in the West. The public only remembered contradictory newspaper stories. Not surprisingly, people had more faith in famous politicians, like Herriot, not journalists. World War II relegated all memories of the Holodomor to the background. There were numerous survivors of the Holodomor among emigrants who ended up in the West after World War II. Some of them kept silent so as not to provoke repressions against their relatives in the USSR. There were also those who wanted to speak out. Many books containing their accounts were published by Ukrainian civic organizations on anniversaries of the Holodomor. Two are distinguished by their fundamental nature: a two- volume reference book entitled The Black Deeds of the Kremlin: A White Book (Toronto-Detroit, 1953-55), and the Ukrainian-language compilation by Yuri Semenko entitled Holod 1933 roku v Ukrayini: Svidchennia pro vynyshchuvannia Moskvoyu ukrayinskoho selianstva [The 1933 Famine in Ukraine: Eyewitness Testimonies about Moscow’s Extermination of the Ukrainian Peasants] (New York, 1963). The Ukrainian diaspora used every Holodomor anniversary to make the truth about the Holodomor known to the general public. Tremendous work was completed in time for the 50th anniversary. The Canadian Institute of Ukrainian Studies at the University of Alberta in Edmonton and the Harvard Ukrainian Studies Institute, founded by Omeljan Pritsak, were already functioning at this time. Trained professionals began to study the 1932-1933 famine in Ukraine. In 1983 l’UniversitО du QuОbec И Montreal hosted a scholarly conference on the fundamental problems of the Holodomor. The proceedings were published in book form three years later in Edmonton. Bohdan Kravchenko, Sergei Maksudov (the alias of the former Moscow-based dissident Alexander Babyonyshev, who concealed his identity to protect his relatives), James Mace, and Roman Serbyn delivered the most exhaustive reports. The late Ihor Olshaniwsky, head of the Organization of Americans in Defense of Human Rights in Ukraine, studied the archives of the US Congressional Commission on the Holocaust and proposed creating an identical commission to study the Ukrainian Holodomor. Congressman James Florio and Senator Bill Bradley, both of whom represented the state of New Jersey, supported Olshaniwsky’s idea because there were many Ukrainian voters in the state. In November 1983 Florio introduced a bill to form the Congressional Commission. When it was introduced in the House of Representatives, the bill bore the signatures of 59 congressmen, most of whom were Florio’s fellow Democrats. Even though one year later this bill bore the signatures of 123 congressmen, leading Democrats in the House of Representatives had little enthusiasm for it. “Why spend American taxpayers’ money on what happened some 50 years ago?” they asked. The Ukrainian diaspora then organized a grassroots campaign in all states with Ukrainian communities. Congressmen, chairmen of congressional commissions and committees, House of Representatives Speaker O’Neil, and US President Ronald Reagan began receiving tens of thousands of individual and collective petitions. Never before or since had Ukrainian Americans organized such a large-scale campaign. Senator Bradley submitted the same bill to the Senate on March 21, 1984. Myron Kuropas, vice president of the Ukrainian National Association, was very influential in the numerous Ukrainian communities of Illinois. At one time he actively campaigned for Illinois Senator Charles Percy, who later chaired the Foreign Affairs Committee. Thus, the passage of the bill in this Senate committee did not encounter any obstacles. The first hearings were held in August and ended with positive results. Addressing the senators, Olshaniwsky said that time does not wait: the surviving Holodomor victims were old and weak, and it was crucial to collect their testimonies as soon as possible. On Sept. 19 the Foreign Affairs Committee approved the bill’s wording, and two days later the Senate unanimously approved the bill. Yet the Foreign Affairs Committee did not submit the bill lobbied by the Ukrainian organizations to the House of Representatives. Bill Bradley saved the day by exercising his right as senator to amend the budget. On Oct. 4, 1984, the last day of the 98th Congress, he appended the funding provision for the temporary commission on the Ukrainian Holodomor to Congress’s Funding Resolution. The House of Representatives, which can veto senators’ amendments, agreed to this amendment without debating it, owing to lack of time, since the Senate had already approved this bill. The Funding Resolution, i.e., a 470 billion-dollar budget for the 1985 fiscal year with a funding provision for the Ukrainian Holodomor Commission for 400,000 US dollars appended to it had to be approved immediately. Without this procedure the government would be left penniless. The US Congressional Commission on the Ukraine Famine was comprised of two senators, four congressmen, three representatives of the executive, and four representatives of the Ukrainian community. At the request of the Organization of Americans in Defense of Human Rights in Ukraine, James Mace, a fellow at the Harvard Ukrainian Studies Institute and one of the few American specialists on the history of Soviet Ukraine, was appointed the commission’s executive director. At Harvard University, Dr. Mace was helping the English historian Robert Conquest to collect and process historical materials for his book about the Holodomor. Conquest had earned recognition for his study of mass repressions in the Soviet Union in 1937-1938. At the request of the National Committee for Commemorating the 1933 Holodomor Victims in Ukraine he started to explore this new subject. In late 1986 Oxford University Press published his book The Harvest of Sorrow: Soviet Collectivization and the Terror-Famine, which immediately created an international sensation. The publishing house Lybid published a Ukrainian translation in 1993 with money supplied by the Ukrainian diaspora in the US. Nobody expected the research team of six Ukrainian-studies scholars headed by James Mace to obtain convincing evidence of Stalin’s greatest crime, given the commission’s short mandate. But Mace performed a scholarly and civic feat. The US Congressional Commission on the Ukraine Famine did not become another bureaucratic committee, as Robbie Palmer feared it would. James Mace and the young American researcher Leonid Herets developed methods that made it possible to ensure the objectivity of testimonies provided by Holodomor witnesses. Layered one on top of the other, the testimonies corrected the subjective nature of these personal recollections. In this way they became a fully-fledged source. As soon as it became possible, James Mace traveled to Ukraine, where he settled permanently in 1993. For many years he worked at the Kyiv-Mohyla Academy and contributed to The Day. “Fate decreed that the victims chose me,” he wrote in one of his numerous columns carried by this newspaper (Feb. 18, 2003). Mace died on May 2, 2004. One year later The Day’s Library Series published a book dedicated to him: Day and Eternity of James Mace, objective proof of the weighty role this American played in Ukraine’s contemporary history.